Vuarnet sunglasses are a brand with a long and storied history. Developed for the French ski team in 1957 by optician Roger Pouilloux, the Skylinx Acier lens was one of the first sunglass lenses to feature a strong blue light filter, making these optimized for the blinding glare conditions encountered around snow. 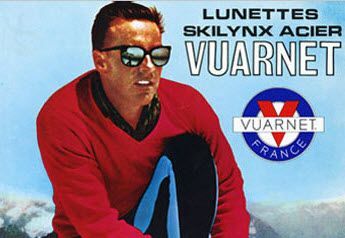 In 1961, after alpine ski racer Jean Vuarnet won the golf medal at the 1960 Olympics, an agreement was reached to use his name for these fine sunglasses. All Vuarnet sunglasses feature mineral (glass) lenses of the highest quality. Even today, they are made only within the Vuarnet factory in France. Vuarnet lenses offer extreme optical quality, featuring hand polished surfaces, including lens edges. Skylinx, Citilynx, P1000, 2000 & 3000 lenses offer lens densities and filtering for any type glare or individual eye need. The Vuarnet PX5000 lenses are amongst the densest lenses made in quality sunglasses, and are well suited to anyone who has found most sunglasses lacking in true glare clocking capabilities. We stock over 60 styles of Vuarnet sunglasses, and offer authentic Vuarnet mineral glass prescription lenses in both single vision and progressive designs. These prescription models are all made only in the Vuarnet factory in France. Vuarnet prescription lenses are the only authentic sunglass lenses made today using digital HD lens technology, for the finest optics you can buy. They are priced accordingly, and they are truly worth the investment in your eyes.